You gotta dig, punk is nasty. It's mean and dumb and hits ya hard in the gut. But that's just a few aspects of punk. For many, it's a way to feel a part of something. It's smart and witty and a way to finally move those parts of us that have always been restricted. That's all Bad Example. I see this band and I more than that, something familial almost, a united front against a reality that can only tear us apart. 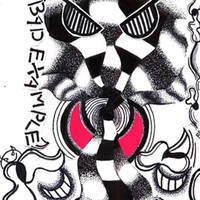 Bad Example is angry and frustrated in an attempt to tear that anger and frustration up and build up a new reality.